Once it became one of the most notable costume pieces in Doctor Who history it also became an integral part of Gallifreyan costuming, especially at conventions. And when this happened geeks and cosplayers all over the world exclaimed “but, but, I can’t knit! How do I get this awesome costume piece?” And thus every Whovian Knitter was bombarded with tear-filled requests to make these dreams come true. What many people don’t seem to realize is the time and effort that go into undertaking is such a huge and daunting project. Sure, it’s just like knitting a bunch of scarves… just all at once… but let’s face it, geeks everywhere would notice if you didn’t use the right shade of colors, altered the pattern, or even wrong yarn materials! And thus, a certain level of blood, sweat, tears, detail and concentration is required for the construction of this crafting monstrosity. Behold: the construction of The Scarf! I found out exactly how long it could take about 3 seasons and a month and a half later… total time knitted: 130+ hours. What I hadn’t done yet was weave in the loose ends and make the tassels. I was so burnt out from non-stop knitting that the scarf ended up sitting unloved in the closet in time out for the sheer exasperation it had caused. For a few months it collected dust, seemingly forgotten, until I met my fiance and he coerced me into watching the bookcase full of old Doctor Who VHS tapes that he had acquired over the years. Seeing more of the scarf in action inspired me to pull it out, brush off the fine layer of dust, and put the finishing touches on my greatest knitting achievement to date! Yes, this is a much larger and monumental achievement than my Jayne hat. So now that I had unlocked the greatest geek knitting achievement of all time… what next? There were no cons coming up, no costume parties (plus I wouldn’t want to spill beer or shots on my preciousss), no viable excuse to wear it to work… I was at an impasse. I also didn’t have the rest of the costume. I then talked to my friend Brian (whose photos have been featured here quite a few times already!) and set a date to do a photo shoot to feature the Baker scarf. I sewed the rest of the costume by hand, packed it with my hiking gear, and the two of us set out to do the shoot at the top of our local 1550ft Bishop’s Peak. It was a super fun hike and once we got to the top the scarf really came in handy with a climber in distress! 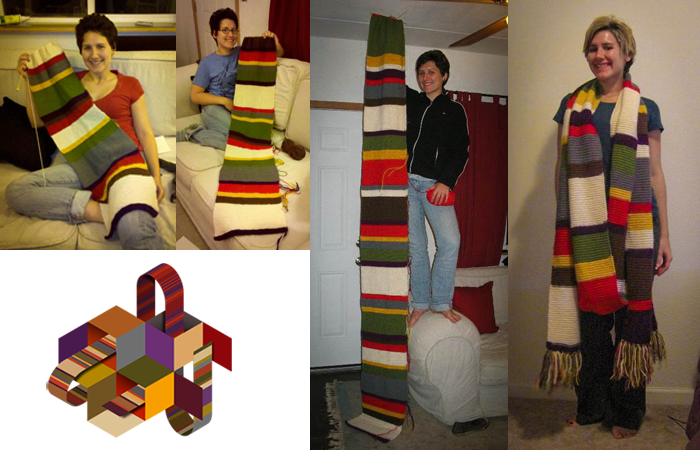 When a Whovian discovers a friend is a knitter, it is very, very tempting to ask them to make you a Doctor Who scarf. On behalf of all knitters out there, we say, please don’t. We love Doctor Who as much as you and you might notice that we don’t even have a Doctor Who scarf for ourselves. There’s a reason: it takes forever and it’s really boring. 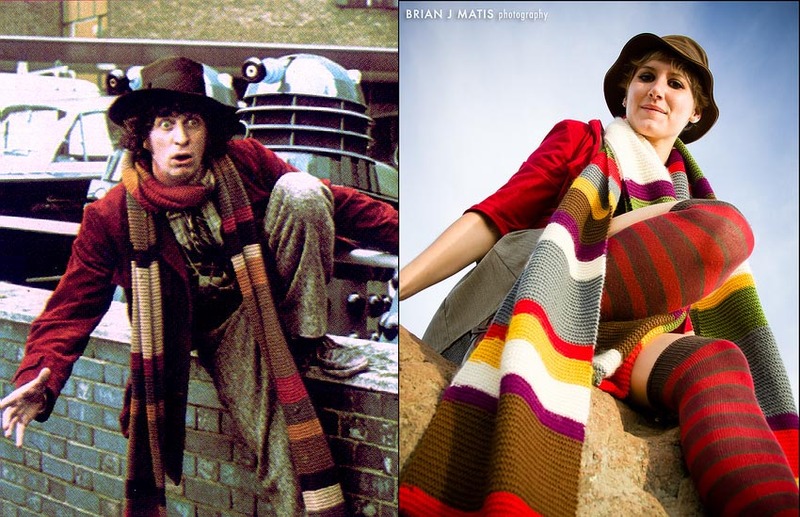 In fact, when made in worsted weight yarn, a 12 foot long Tom Baker scarf contains 56,448 knit stitches. That means someone is cursing you 56,448 times while holding pointy sticks. Catch our drift? 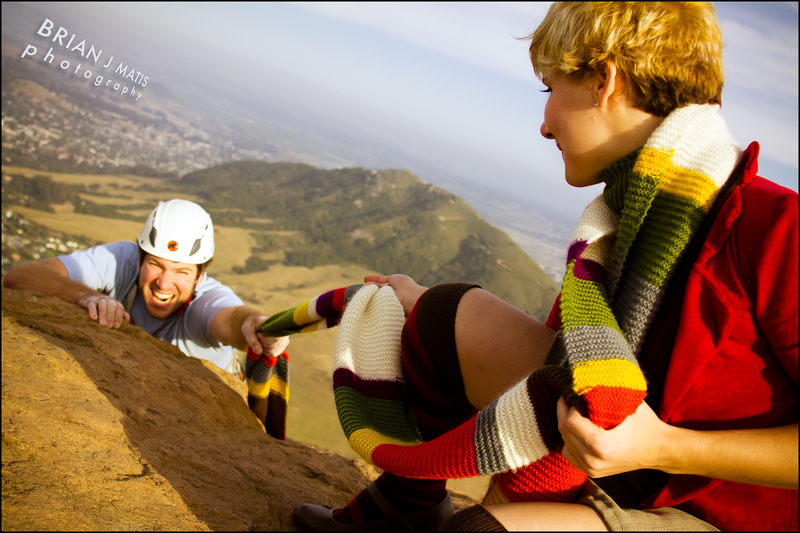 Embrace laziness and keep your knitter friends by picking up the Doctor Who Deluxe 12′ Scarf. 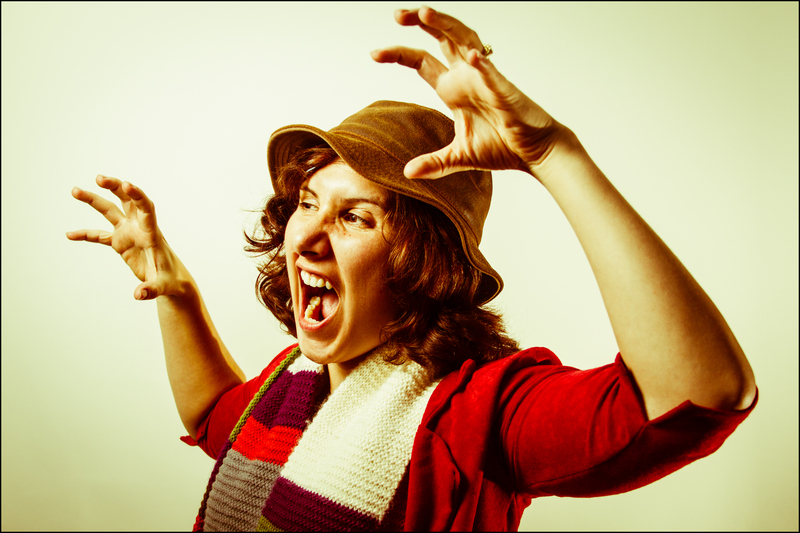 Use it to complete your Tom Baker costume for convention season or wear it as your regular scarf in chilly weather. It’s long enough to wrap at least twice around the average neck, with plenty of dangle to spare. Just don’t get it caught in the TARDIS door, okay? This entry was posted on November 28, 2012 by aduialdin. 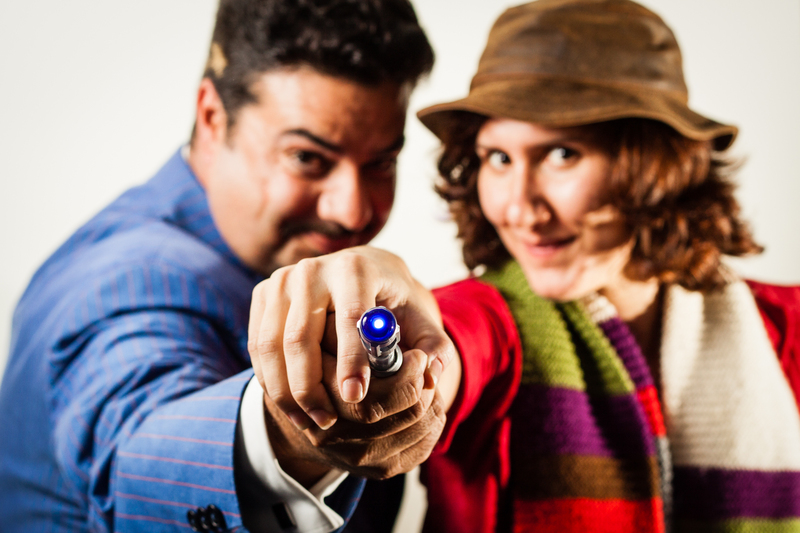 It was filed under Food and Crafts and was tagged with cosplay, costuming, Doctor Who, geeks, knitting, photography, scarf, TARDIS, ThinkGeek.